Interested? Click here to find out more about the fair, its location, and other exhibitors. You'll find a fine selection of books, including highlights of US and European literature, exceptional titles in fine press, children’s books, and modern first editions. See remarkable publications from private presses ranging from the Kelmscott Press Press and Golden Cockerel Press to modern fine press including Heavenly Monkey and the Two Ponds Press. We will also bring rare James Bond and new arrivals by Charles van Sandwyk, many of them signed. Just let us know if you'd like to reserve a title. 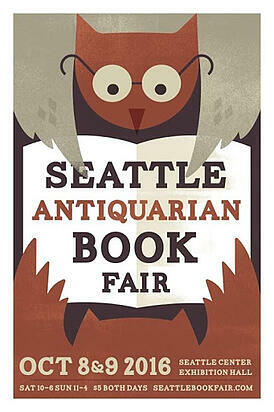 The Seattle Antiquarian Book Fair has a long tradition of excellence, bringing together some of the best book dealers from around the country. If you are interested in rare and beautiful books, you won't want to miss it. Don't be a stranger: sign up for your free ticket! We hope to see you next week in booth 606.